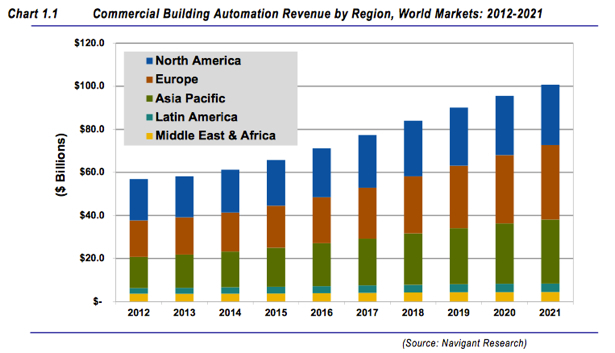 Global commercial building automation systems revenue will grow from $58.1 billion in 2013 to $100.8 billion in 2021, according to a study by Navigant Research. Commercial building automation systems continue to evolve from point solutions built from proprietary products toward open and integrated systems based on modern digital information technologies. Integrated by new building management systems, the automation of HVAC, lighting, fire and life safety, and security and access controls is increasingly forming the foundational infrastructure for advanced energy management products and services. The resulting solutions are aimed at reducing the nearly 12 percent of total global energy end use by the commercial sector, according to Commercial Building Automation Systems. The global market for commercial building automation systems is driven in general by new and retrofit commercial building construction and more specifically by the energy efficiencyrequirements applied to this construction. New commercial construction has been suppressed by the financial crisis of 2008 in most of the global market, with the exception of certain parts of Asia Pacific, and the building controls market has suffered as a result, according to the report. However, renewed economic growth and accelerating energy efficiency targets for commercial buildings are combining to offer significant market growth opportunities. Additionally, the adoption of new embedded computing, communications, sensing, and software technologies is fundamentally changing the underlying products and services within the commercial BAS market, presenting risks and rewards for various industry stakeholders, the report says. The North American building automation systems market generated revenue of $535.3 million in 2011, up 0.7 percent over the previous year, according to a report by Frost & Sullivan released in October 2012. This entry was posted in Industry News and tagged Asia Pacific, BAS, Building automation, Building management system, Commercial Building Automation Systems, energy manager today, HVAC, Navigant Research, Sullivan Frost on November 27, 2013 by setpointsystems.